英文摘要：Based on viscous fluid theory, the hydrodynamics performance of tandem type pod propeller was discussed by using CFD technology. Then by numerical simulation of a single screw podded propulsor, and compared with the experimental results to verify the accuracy of numerical calculation method. The hydrodynamic performance of tandem type podded propulsor with different deflection angles is calculated by using the suitable numerical model and method. The results show an agreeable regularitywill provide reference for the prediction of hydrodynamic performance of tandem type podded propulsor. 熊鹰, 盛立, 杨勇. 吊舱式推进器偏转工况下水动力性能[J]. 上海交通大学学报, 2013, 47(6):956-961. XIONG Ying, SHENG Li, YANG Yong. Hydrodynamics performance of podded propulsion at declination angles[J]. Journal of Shanghai Jiaotong University, 2013, 47(6):956-961. REICHEL M. Manoeuvring forces on azimuthing podded propulsor model[J]. Polish Maritime Research, 2007, 14(2):3-8. 黄胜, 王超, 王诗洋. 不同湍流模型在螺旋桨水动力性能计算中的应用与比较[J]. 哈尔滨工程大学学报, 2009, 30(5):481-485. HUANG Sheng, WANG Chao, WANG Shi-yang. Application and comparison of different turbulence models in the computation of a propeller's hydrodynamic performance[J]. 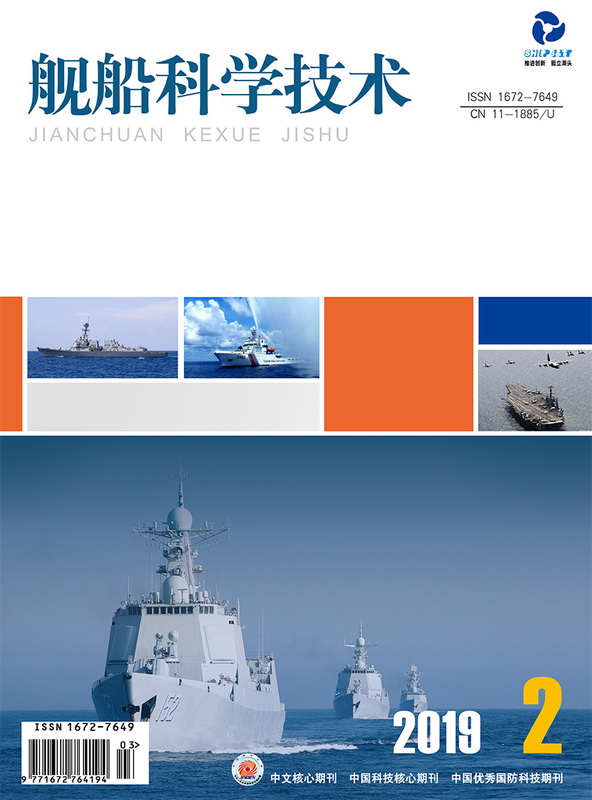 Journal of Harbin Engineering University, 2009, 30(5):481-485. 马骋, 张旭, 钱正芳, 等. POD推进器技术发展及其应用前景[J]. 船舶工程, 2007, 29(6):25-29. MA Cheng, ZHANG Xu, QIAN Zheng-fang, et al. Technology development and its application prospect of POD thrusters[J]. Ship Engineering, 2007, 29(6):25-29. GÜNTHER B. Resistance test, propulsion test and wake measurement[R]. Potsdam:SVAtech GmbH, 2006:13. 贺伟, 陈克强, 李子如. 串列式吊舱推进器操舵工况水动力试验研究[J]. 华中科技大学学报(自然科学版), 2015, 43(1):107-111. HE Wei, CHEN Ke-qiang, LI Zi-ru. Experimental research on hydrodynamics of tandem podded propulsor in azimuthing conditions[J]. Journal of Huazhong University of Science and Technology (Nature Science Edition), 2015, 43(1):107-111.